Courtesy of WOWSA, Abu Dhabi, United Arab Emirates. The final stage of the FINA/Hosa Marathon Swim Series in Abu Dhabi has been changed to November 9th. 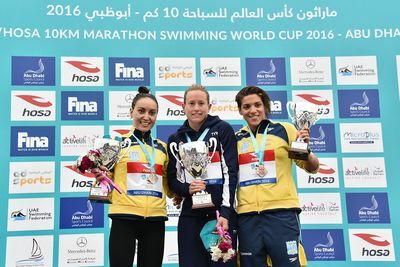 Poliana Okimoto (silver), Aurélie Muller (gold) and Ana Marcela Cunha (bronze) are shown above in a FINA photo at the 2016 FINA/HOSA 10K Marathon Swimming World Cup held in Abu Dhabi, United Arab Emirates in 2016.